Don’t miss this. We’ve teamed up with partners, ambassadors and trustees to create the Forever Manchester Online Silent Auction. 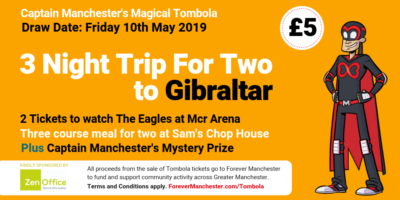 We’ll be kicking off right at the start of Forever Manchester Week on 10th June and the lots we have available mean we have something for everyone. Of course there are other fun activities you could be bidding for like champagne tasting, chocolate experience for 40 and ‘Eat out for a Year’ – you read that right! All bids are silent, so you won’t know how you are up against and who the winner will be. There are minimum amounts that have already been selected by the team – so good luck to all those that get involved. Go on – get bidding for charity! Right here.